drain or outdoors (never in rain or on wet ground). Do not allow the machine to stand in liquid while emptying. For best results, spray out liquid with machine set to “Tool” to prevent brushes from movement and wear while emptying. Using this method you can spray out any remaining liquid either through Hand Tool or machine spray tips. Clean the vibrating brush by pulling down on the plastic brush body. After each use, unplug the machine from the mains and use your finger or an old comb to remove any debris from the vibrating brush. If you used any Rug Doctor Pro attachments remove debris from the attachment brush. the machine. If debris is present, remove the filter screen by pushing it right and compressing the spring until the filter end is clear of the dome. Clean by running water through the screen from the inside to the outside. Replace by compressing the spring wire and inserting the black end securely into place in the hole inside the dome. rectangular filter screen located in the fill opening of the solution (lower) tank. If debris is present, remove screws that hold the filter in place and remove filter from the solution tank opening. Clean filter by holding it under a water faucet and letting the water run through the filter in the opposite direction from the normal filling flow. Replace the filter screen and fasten it in place with the two mounting screws. Clean the solution tank line strainer. When the solution tank filter screen is removed for cleaning, inspect the cylindrical filter mounted on the end of the solution line inside of the lower tank. If debris is present, remove the filter by pulling it off the solution line. Hold the filter under flowing water until debris is cleared. Replace the filter by pushing it over the end of the solution hose. Always use recommended Rug Doctor Pro cleaning solutions. 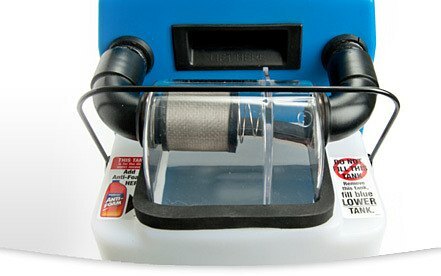 Do not use dye or bleach in this machine as this will permanently damage your carpets. Store the machine indoors out of dusty, wet and freezing areas. This prolongs the life of your Rug Doctor Pro machine and helps keep it trouble free. Do not expose Rug Doctor Pro machines to freezing temperatures for a prolonged period of time. In freezing temperatures, liquid in the machine system can expand and damage the pump and solution hoses. Take care when transporting your Rug Doctor Pro machine to avoid damaging the tanks or outer fixings and casing. Rug Doctor Pro machines are designed for rugged use. However, avoid mishandling such as dropping the unit or transporting it unsecured in a van. Please note that jarring from sudden vehicle starts or stops can also damage the machine. Always use Pro Anti-Foam with Pro Upholstery Cleaner or when otherwise needed to prevent excess suds in the upper (white) tank. Foam should never be present in the dome filter as this could result in damage to the vacuum motor. Do not attempt to repair a warrantied machine or you will void the warranty. Contact the Rug Doctor or your distributor for information on where to send the machine for repair or click here. Do not use replacement parts other than those available through Rug Doctor Pro or an authorised distributor. Proper performance of the machine could be affected if substitutions are made. Avoid picking up loose dirt or hard/sharp objects with the carpet cleaning machine as this could cause damage to the Rug Doctor Pro machine. To prevent this vacuum the area before starting the cleaning process. This machine is not outfitted with a fine dust filter. Do not use the machine for dry vacuuming as damage to the vacuum motor will occur. To avoid pump damage, do not continue to press the spray (pump) switch when the solution tank is empty. This forces the pump to continue running without water passing through it which causes it to over-heat and can melt/damage components. If you are having any problems using your Rug Doctor Pro please refer to our Troubleshooting guide by clicking here. If you are still experiencing problems please call our Consumer Support Specialists (Mon-Fri 9.00am - 5.00pm) 01903 235558.